Captain Roy Herrington Retires From The CAF After Over 41-Years Of Officer Service! On 5 April 2018 the Branch Association was privileged to attend the Depart With Dignity and CO's Parade for Captain Roy Herrington, CD, and 205 Collishaw RCACS. Captain Herrington had a remarkable 41-year, 4-month and 1-day military career, all of which was spent as a CIL-CIC/COATS officer. Adding that time to his engagement as a 676 Kittyhawk Air Cadet, and Captain Herrington has likely set a national record! 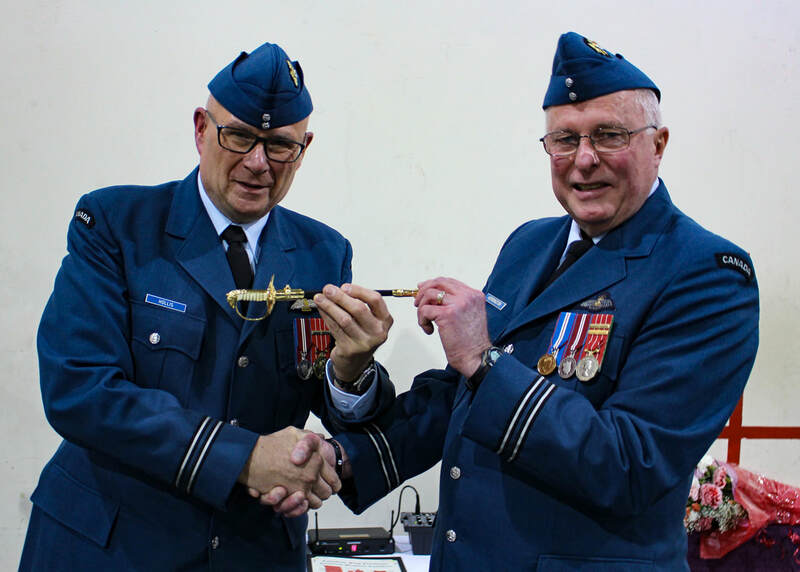 Photo (left): Branch Association Treasurer Captain James Hollis, CD presenting a hand-made miniature Air Force Sword to Captain Herrington. Although Captain Hollis made a concerted pitch for Captain Herrington to become more involved in the Association upon his retirement from the CAF, Commander Brad Henderson, CD, CO of the Regional Cadet Support Unit (Pacific) already "called dibbs" on his newest Civilian Instructor and promptly put Captain Herrington back to work doing what he has done so passionately for over 4 decades! Click-on the photo for a larger picture.